Ok, I've spent some time doing some experiments and gathering info on Video File playback on the X920 from SD. ALL video file playback data in the manual is wrong regarding USB/SD. None of the listed video codecs, MPEG4, H.264, or WMV will play back from USB/SD. Under DIVX information, the manual also states that "DivX files on the external storage device (USB,SD) cannot be played." At least for my personal AVIC-X920BT, this is false. After much experimentation, I've discovered that the ONLY video format I can get to play from USB/SD is DivX. I fought with H.264, mpeg4, and wmv for DAYS, trying to get things to work. Today, I got frustrated and just threw a bunch of random car vids on the MicroSD and gave it a shot, and sure enough some worked! I was convinced NO video would work from SD. So I brought the card back inside and analyzed the codecs on the working files, and all were encoded DIVX5 for video, MP3 for audio. So, if you are getting frustrated trying to get video running from USB/SD, please IGNORE THE MANUAL, encode your files in DIVX5 or DIVX6, and you should be good to go. Well I have a Z110BT and have a bunch of DIVX music videos (that I encoded with DIVX converter using Home Theater Profile) on my SD card and it doesn't even display the filenames on them. I do however have a movie (Twilight - New Moon) in there in .AVI format that plays fine. For video conversion, I'm using a program called Xilisoft Video Converter Ultimate 6. I'm using the DivX - Movie profile to encode to Divx5. Now, after I posted that last post, I tried converted Saving Private Ryan from MPEG to DivX, and while it works on my PC, doesn't work on the unit, I get the Unplayable files will be skipped error. I also encoded Akira to Divx5 from MPEG4 and it gave me a File Resolution error. I encoded both of these in their native resolutions, so evidently Akira is too high, and there' s still a problem with SPV file. Next week after the holiday I will be doing more trial and error with different bitrates and resolutions to try to get those files to play. Once I do, I'll post my findings. I will repeat, for general knowledges sake again, that the information in the manual for the X920BT regarding USB/SD video playback is completely wrong in every way. There's some issue possibly with sound track, are you encoding these in STEREO or 2 channel? If the movie gets encoded with 5.1 sound it might choke. NOTE: I do see in the above that it was formatted 2 channels.'' My unit is arriving next week, so can't test this only offer a suggestion. Don't know for sure, but I do all my movie encodes with Nero - they have a output format for iPod that is an MP4. Guess as a last resort you just play movies through the iPod. Success. I am able to get playback using the XVID video codec with these settings. I use the ffmpegX application on a Mac to do my conversion. I have encoded around 20 videos with these settings and they all play on the Avic. I'm using ffmpegX on Mac OSX for encoding. I wanted to follow up there. After rgarjr's post, I tried XVID and got the same successes as I did with DIVX. Akira played just fine once I brought the resolution down to 640 x 360. No problems at all. 846 meg file. Yeah I'm wondering if 768 kb/s (as mentioned on the manual) is the maximum Bitrate you can view on the SD. Ahh, I may not have been clear, I actually meant actual file size, not bitrate in my previous post. All my successes so far have been at 750 bitrate, like yours. I tried encoding the Saving Private Ryan again, with bigger, but still sub 1gig file sizes, and got failure, but my bitrate was 1300. Before I left work yesterday, I set up an encode for a sub 1gig file size, and a 1000kb/s bitrate, so I'll try that on my first break and see what results I get. Ok, after failure at 1K bitrate, I tried 900, and had success. 900K is the highest bitrate I've used so far, and 846 megs is the biggest file so far. Well, I am able to play movies from both SD and USB ... just keep in mind that if you AVI is not compatible, you may only hear the song or nothing at all. File size is around 1 GB but I already play Avatar with 1024 kbps video that shot up to 2.2 GB, playable but lag seriously, which confirm that the ARM CPU is way under-powered. Dont' forget to select the video mode in the AVIC to NORMAL instead of WIDE, within audio/video settings of the AVIC. I don't know about the X710, but on my X920 I wasn't able to get any video to play from USB/SD in any format other than DivX/Xvid. Bitrates had to be have been set for an average of 900 or below on video, 192 or below MP3 for audio, and the file sizes have had to be under 916 (so far tested) megabytes. I was not able to get any MP4 encoded file or WMV to display from USB/SD on my X920. did more encoding research here. I tried a movie (Avatar), set the res to 720 X 400 @ 900 kbps, movie was around 1.23GB and it gave me a resolution error. Tried a music video at 999 kbps bit rate (640x272) and plays fine. I did a similar fight today. I used AVS Convertor and tried a whole slew of formats and also tested USB/SD and DVD-R medias. My tests are listed below, but the best format I've found was DivX 6 .avi format, 1500 kb video, 192 kb audio on a DVD-R. The results are on the left. There is a cap on video bitrate like the manual says at 1000kb/s for the SD Card. This is NOT the case for the Data DVD-R. A regular dvd of up to 10.8 Mb/s can be played with the disc and the standard of 1500 kb/s works well with the DivX, but won't work with the SD. 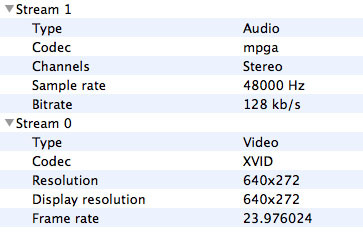 All the SD media at 640x480 was choppy (words didn't line up on the music videos) compared to the DVD-R. So use a data DVD-R if want smoothness and/or bitrate. Back to SD conversion: most converters aren't exactly 1000kb/s, so you have to throttle back a little to get the output at as close to 1000 as possible without going over (that's why I used 995kb/s as the audio output). The native resolution of the screen is 800x480 but since that format is neither 4:3 or 16:9, there's no reason to try to get to that resolution, however, it does work. Also I noticed when playing from the SD, the smaller video resolutions do not auto scale up, but they do when playing from the DVD-R. Note: I used the x910bt for these tests. the z110bt should be the same. There is no hardware difference between the 110 and 120. Like I posted above, I have success with AAC audio @ 192 kbps, MP4 video at 640 kbps, screen size at 720x404, perfect for DVD to MP4 conversion, somewhat smaller than 640x480 but it keeps the original aspect ratio of the DVD. With this setting, Avatar DVD yields a size of around 900 MB for 2h41m of movie.